Now you can get my family recipe for those amazing chicken croquettes you saw me make on the Food Network Show “Clash of the Grandmas.” They are golden brown and crispy on the outside; they are moist and delicious on the inside. So many have asked for the recipe, now you can get it inside my new recipe book Collard Greens and Caviar eRecipe Pop up Book, which features my most closely held and coveted recipes teased on my social media sites. The recipe book is now available on Amazon.com in Kindle download and paperback. What else will you get? Recipes for my Tarragon Panko Coating Mix, and my Sweet Potato Bread Pudding with Praline Topping. As a bonus, I’ve include a section called “Pantry Basics 101” to help you stay stocked and ready to magic in your own kitchen. Enjoy the video below and see my inspiration for making the chicken croquettes on the show. Now – go forth, cook fearlessly and eat well my foodie friends! It’s just a pot of stew, right? That pot of vegetables and meat that slowly simmers in a savory stock transforms itself into a masterpiece of humble beginnings and epic ends. It is imbued with pomp and personality. It is comprised of creativity and resourcefulness. And it is reflective of the composer’s emotions and experience, virtue and values. A stew is an often a magical and sometimes imaginative concoction of ingredients that bond harmoniously. Yet, a stew is always stalwart even in the presence of the most delicate ingredients. And no two are ever alike because each individual pot is a personification of the moment and the marrow in which it is made. A pot of stew is like bushel of love in a bowl. Pare that bowl of stew with a generous portion of homemade corn bread or a hearty artisan roll, and you may just fall in love or get someone to fall in love with you. It’s shamefully clear, I love waxing stewfully about stews. With all that said, lets get down to simmering business. With the fall of the year upon us, chances are you will be making a pot of stew or two or three before the daffodils bloom in spring. In making a stew, there are no rules – let your imagination be your guide. However, from my years of stew making, I’d like to share a few “stew tips” with you. Get to first base. The first step in making any stew is to create a base packed with flavor. I like starting out with a combination of ingredients like onions, garlic, shallots, celery and bell pepper sautéed in some kind of oil or fat like butter, olive oil, or Grapeseed oil. Sometimes I infuse extra richness by adding a little sesame oil or lard. Stock it up. 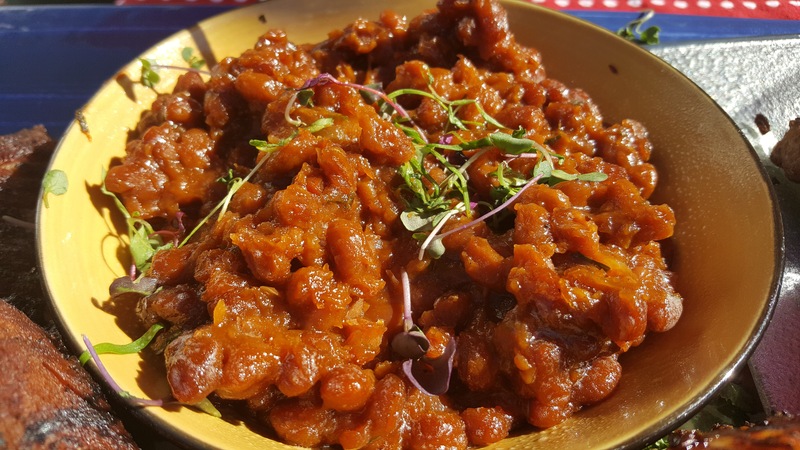 Whether you use chicken, beef, vegetable or seafood stock, elevate the favor by adding a little wine, beer, pumpkin puree, vegetable juice, clam juice or even fruit juice to your taste. I often deglaze my sauté pan with wine (white or red) or beer (craft or flavored). Sometimes I pour a little directly in the stock as well. I recently made a tomato based Italian stew and added a little orange juice; it was a great flavor enhancer. Use a few unusual suspects. We know the usual suspect when it comes to making stews, but try a few unusual suspects like yams, white sweet potatoes, Brussels sprouts, turnips, rutabagas, roasted beets to mention a few. When the usual and unusual suspects cozy up in a simmering pot, they give your stew an amazing “one off” depth of richness that is surprisingly good. No naked proteins. Now that I have your attention, the point here is to always season then brown proteins like beef, pork, chicken and lamb in oil or fat before adding them to your pot. If you are making an all root vegetable stew, the same rule applies. Color equals flavor and the more color you get on the meat, the more flavorful your stew will be. When you brown that seasoned protein, you sear that seasoning right into the flesh. For a quick seafood stew, I browned shrimp and rockfish at high heat in a little Grapeseed oil before I added them to the stew. The color and flavor was awesome. Get fresh with herbs. Using fresh herbs gives your stew a freshness and brightness that dried herbs don’t deliver. Sure you have to use more of them, but it is so worth the effort. Some herbs are great for simmer and some are good for finishing. 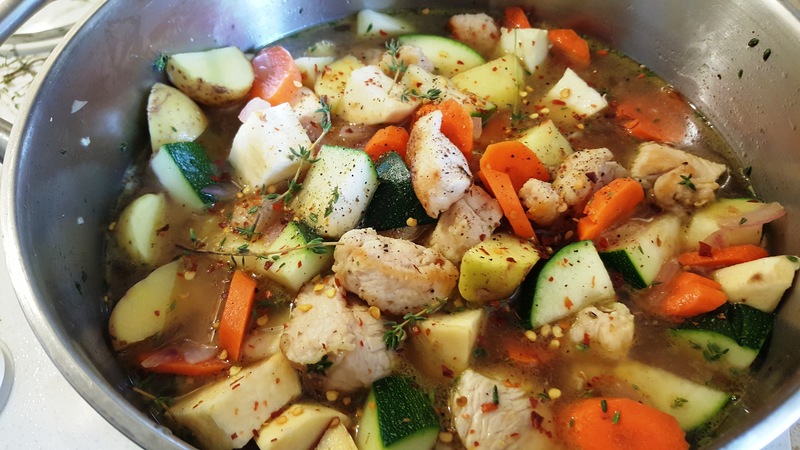 Try finishing your chicken stew with a little fresh mint or simmer a little fresh tarragon in your next beef stew. Cut your turkey tenderloin into chucks and generously season them with salt and pepper. Lightly coat the chunks in flour. Add a few tablespoon of Grapeseed oil to a skillet and heat. Add turkey tenderloin chunks and brown until almost done. Remove from heat and add to a stock pot. Add a little more Grapeseed oil to that same skillet if needed, heat to medium and sauté your onions and garlic about a minute then deglaze the pan with white wine and add to stock pot. To stock pot add cut white sweet potatoes, Yukon potatoes and zucchini , sliced carrots, fresh thyme leaves, 2 teaspoons of salt, ¼ teaspoon black and red pepper flakes, and canned corn. Bring to a boil, cover and simmer 1 hour. Serve with corn bread or dinner rolls. Tip: For added thickness, place 1 cup of stew stock and 2 tablespoons of corn starch in a blender. Place your hand on top of the blender lid to prevent it from dislodging. Mix well. Stir the thickened mixture into stew. Vegetable medley from the grill of Daria Le Sassier of Le Sassier Catering. There’s nothing like the sound of women in the kitchen. Their laughter and voice inflections are almost lyrical. Their animations and antics are enlivening. And no matter what race, creed or color, when women gather around food, it’s always a magical experience bathed in warmth and richness. The end of the summer is near, and the last big summer holiday is approaching. 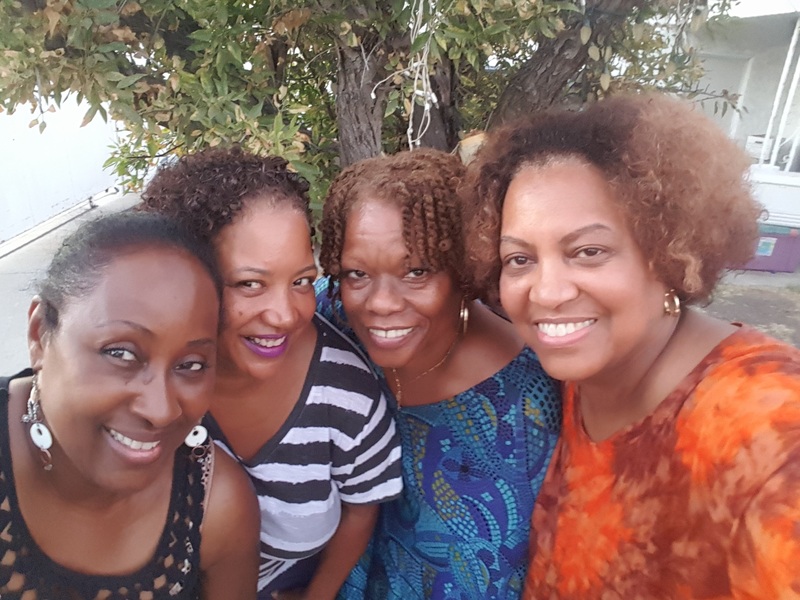 My friend, and Los Angeles based caterer Daria Le Sassier of Le Sassier Catering, gathered a few sister friends together for a little pre-Labor Day celebration. The girls. Left to right: Yours truly along with: Daria Le Sassier, Owner Le Sassier Catering; Pat Prescott, broadcaster and Morning Show Host of LA’s 94.7 The WAVE; Karani Johnson, Los Angeles based writer and television editor. Daria has been a caterer in this town for over 30 years. She has a vast client list that ranges from individuals, social organizations, politicians and the entertainment industry. 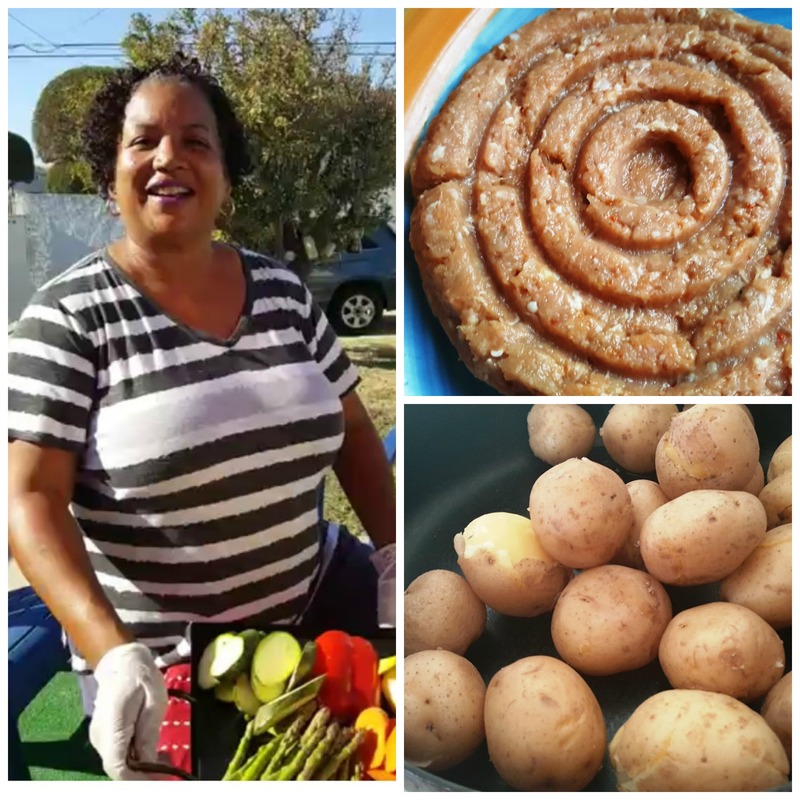 She is one of the most sought after caterers in Los Angeles largely because of the authentic New Orleans style influences in her menu offerings. Her “food to tablescape” approach always elevates ordinary dining experiences to casual elegance. Paella, jambalaya, ribs, red beans and rice, catfish and crab cakes are among her most requested items. And she has a flare for transforming basic “comfort food” into coveted cuisine. Those early experiences showed Daria the important role food plays in deepening and strengthen family ties. When she became a parent, she said those lessons learned were more defining than she ever imagined. After years of experience as a caterer, her artistry and mastery of all aspects of her profession have been at the center of her success. And let’s not forget about the food. It’s certainly her calling card and what sets her apart from so many. Daria says simple, fresh ingredients always work best. Left: Daria preps vegetables for the grill. Right top: seasoned ground turkey burger destined for the grill. Right bottom: boiled potatoes for potato salad. In this age of epicurious intrigue, food adulation and culinary stardom, Daria remains true to her passion for cooking “good food” and remains unfettered by the latest gastronomic movement. When planning our pre-Labor Day menu, Daria focused on the favorites – all which were fit for a girls day dinner. Baked beans, baby back ribs, boneless chicken breasts and wings, corn salsa, Texas caviar, grilled catfish, potato salad and peach mint sweet tea. It was a menu that left us wide eyed and speechless. Our pre-Labor Day spread. 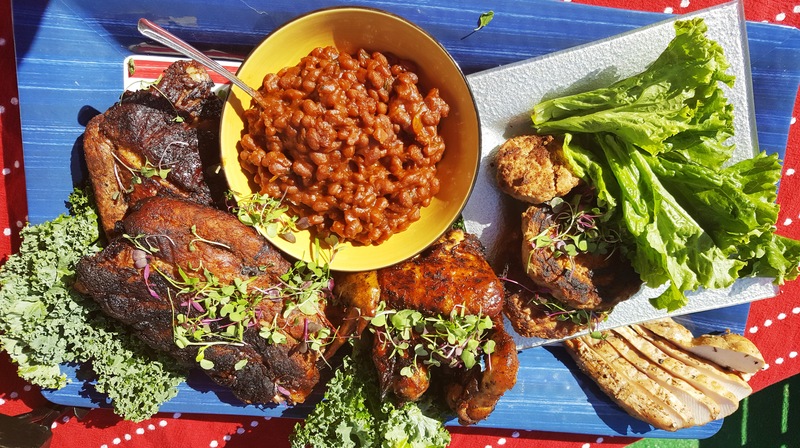 Barbecue ribs and chicken wings, baked beans, grilled turkey burgers and boneless chicken breasts. Not shown: Grill catfish, potato salad, corn salsa and Texas caviar. 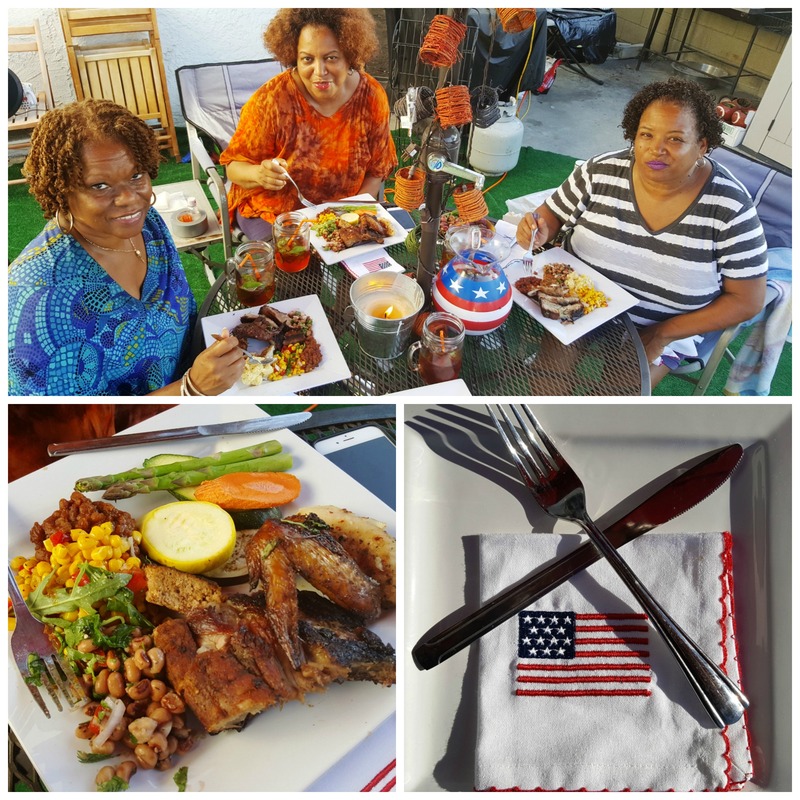 We dished, slipped and watched as she prepared these Labor Day delights. She even enlisted our help in chopping, stirring and helping out. Top: Pat Prescott, Daria Le Sassier and, Karani Johnson enjoying the meal. Bottom left: a plated delight. Bottom right: holiday place setting. Plan your shop time. Shop for your ingredients at least three days prior to your event. The selection is better, there aren’t as many people in the store and it’s less stressful. Prep ahead. Cut vegetables and meats and store them in the refrigerator. This way you aren’t doing everything on the day of your event, tiring yourself out. Season everything at least two days before your event. The longer it sits in the refrigerator seasoned, the better it is going to taste. Ask for help. Have a family member or friend come over and help cut, dice and help with your prep. Use catering services. Some menu items you many not want to cook like ribs, appetizers or desserts. But plan ahead because holidays are peak seasons for caterers. Pace yourself on the big day. Get an early start, get your grill going and ease into cooking now that most of the prep work has been done. Remember the secret to great ribs is to cook them on low heat and slowly. Set up a buffet or serving table. This allows guests to serve themselves. Just keep it replenished and freshened up. 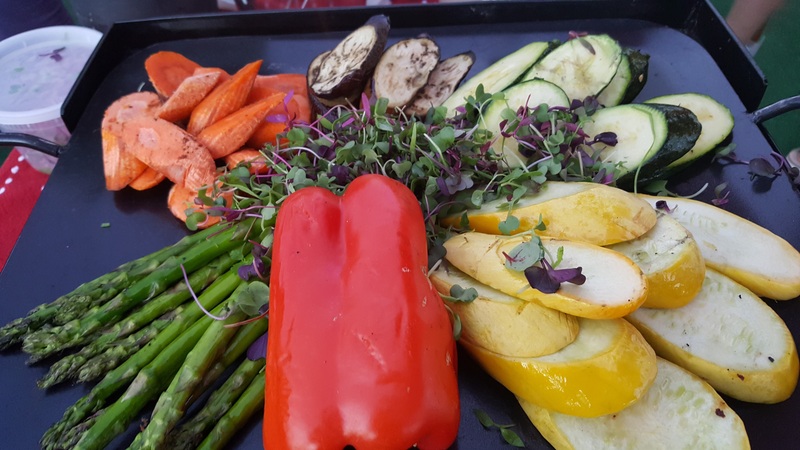 In this video, Daria shares how you can create a grilled vegetable platter that has the “wow factor” in taste and presentation. With the wealth of great family recipes that have become the cornerstone of her business, Daria says they may find their way in a cookbook someday. But for now she’s focused on her business and perhaps expanding her brand into the realm of event consulting. You can follow Daria on Facebook at https://www.facebook.com/LeSassier-Catering-Events-242470832545353/. Now – get cooking! In a bowl, mix all of the ingredients together and pour into a cast iron skillet. Bake at 350 degrees Fahrenheit for about an hour until the beans become thicken. Stir them several times during the hour. If beans start to become dry, add more barbecue sauce, syrup or butte, to your taste. We are unquestionably an epicurious culture. We get a lot of help from the wave of new food blogs, magazines, and articles now delivered to our smart phones each day to the wealth of cooking classes and schools available for those with cooking aspirations and culinary dreams. And let’s not leave out the explosion of network food and cooking shows that range from instructive to pure cooking competitions. Oh but the culinary rock stars that have emerged from this epicurean explosion are as awe-inspiring as they are entertaining. 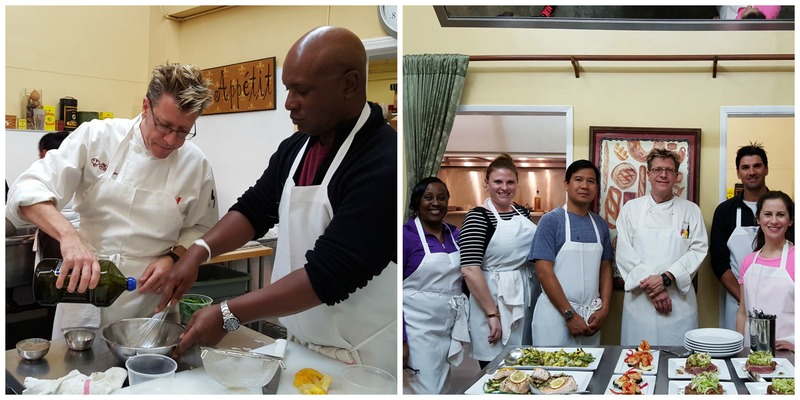 I’ve been fortunate enough to not only meet a local culinary rock star – who just happens to a Los Angeles native – but I’ve had the opportunity to attend his cooking school too. Left: Chef Eric Crowley. Right: Chef Eric’s Culinary Classroom. 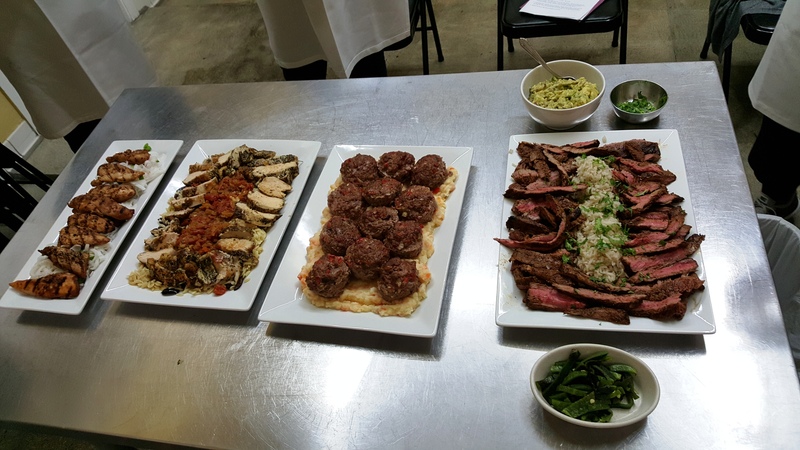 Chef Eric Crowley founded Chef Eric’s Culinary Classroom in 2003 (located in West Los Angeles) where he offers many recreational, individual, couples, kids, and professional cooking classes. He’s a media favorite with frequent appearances on local stations KTLA, KCAL 9, NBC 4, FOX 11 as well as BET, E! Entertainment and more. His extraordinary passion for cooking and teaching are no accident. His father was a teacher and his mother was a gourmet cook who was quite fearless in the kitchen. However his road to the culinary world was not a straight line. Interesting enough, he started out as a saxophone player and music major at California State University at Northridge ( or CSUN – my alma mater). Following CSUN, he started working at a law firm in Los Angeles. But when a cooking class ignited his passion for cooking cultivated by his mother, he got a part-time job working in the kitchen of a local restaurant. That led him to enroll in the Culinary Institute of America in New York where he graduated with honors. What followed was a stay in Europe where he worked at Michelin Star restaurants in Barcelona and Munich. Upon his return to the United States, he was hired by the Patina Restaurant Group where he supervised catered events and intimate dinners. Left: Chef Eric assisting student. Right: Students in my Culinary Basic Series class. It was fortuitous that the teaching bug bit Chef Eric. It happened after filling in for a friend who taught at a culinary school. Chef Eric said the student feedback that followed was so positive that the “light bulb” went off and he knew teaching was his calling. Since Chef Eric’s Culinary Classroom opened in 2003, he has taught over 7,500 students. Some of his former students have gone on to pursue their culinary dreams and started successful businesses after completing his Master Chef and Master Baking/Pastry professional certification programs. Although I twirl a pan or two with relative ease, I wanted some professional training. I enrolled in Chef Eric’s 4-Week Culinary Basic Series. I learned that my basic skills needed a little sharpening. I must admit, I’m sharp now. Literal speaking because in the very first class we learned about knife skills. “Having a good quality knife and one that can be sharpened can make your time in the kitchen that much more enjoyable,” emphasized Chef Eric. This tip has already paid dividends for this home cook. Featured here from week 2: Spice Rubbed Skirt Steak (Carne Asada) with Guacamole and Pilaf-Style Rice, Mama’s Meat Loaf with Mashed Potatoes and Carrots, Asian Five Spice Chicken Skewers With Spicy Peanut Sauce, Thai-Style Noodle Salad with Lemon Grass and diced Cucumbers, Hearty Chicken and Chile Stew with Tortillas, Lemon Orzo Pasta with Kalamata Olives and Chicken with Tomato Herb Sauce. 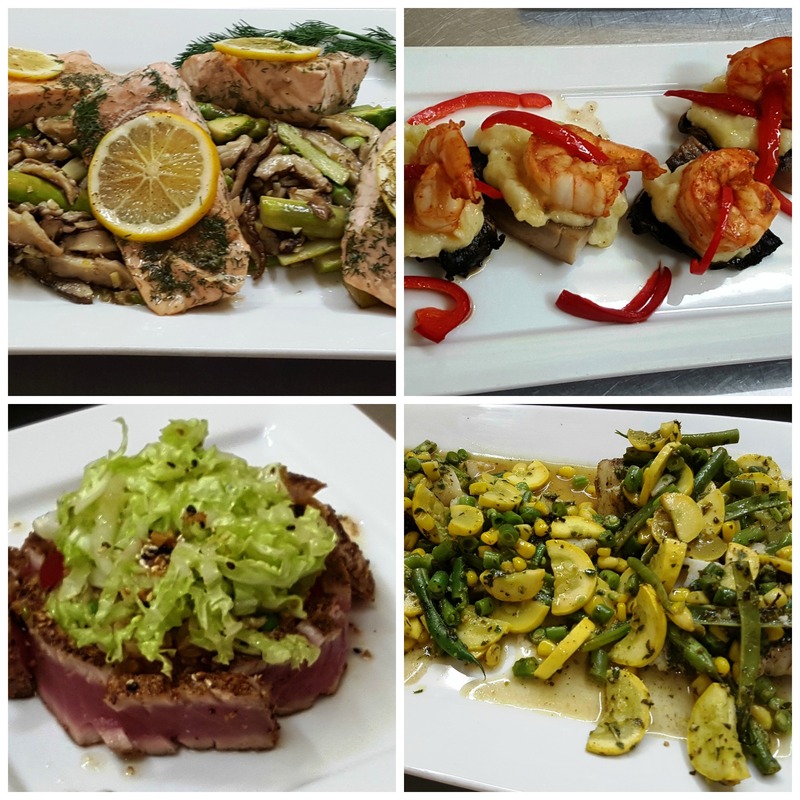 The classes are taught in a professionally designed, fully equipped kitchen stocked with the freshest ingredients. Upon first glance, the menu of dishes we were slated to prepare each class seemed overwhelming. But we quickly learned that Chef Eric’s pre-cooking class discussion was great preparation before we were dispatched to our workstations. Featured here from week 4: Seared and Spice-Crusted Ahi Tuna drizzled with Sesame Dressing on Julienne Lettuce, Brown Rice and Edamame Beans with Soy Sauce, Salmon Steamed in Wine and Spices on Mixed Greens with Balsamic Vinaigrette, Grilled Chipotle-Spiced Shrimp and Grilled Portobello Mushrooms with homemade French Dressing, Succulent Featured here from week 4: Bass and Mixed Vegetable Packets with Mint and Basil Pesto, and Sole Vin Blanc with Ginger-Lime-Scallion Butter with Shiitake Mushroom and Asparagus Sauté. 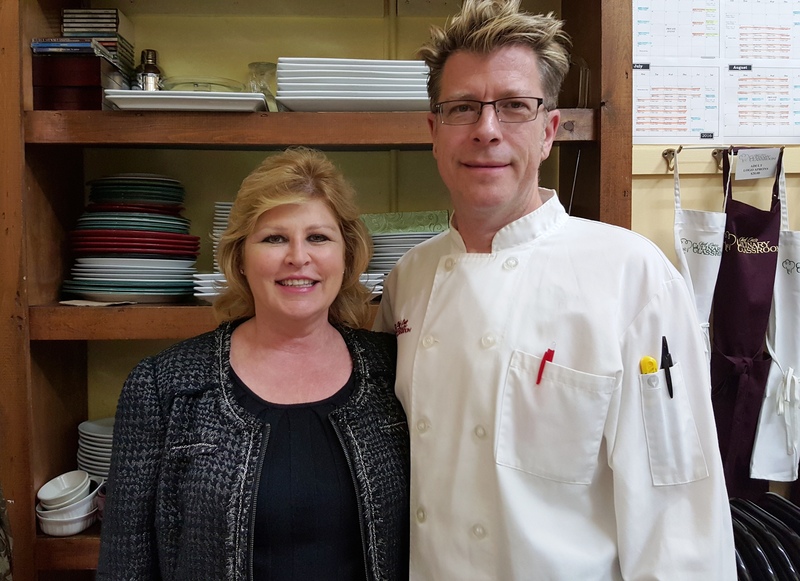 Chef Eric and his wife and business partner Jennie Crowley (President and COO) have put a lot of love, sweat and care into every aspect of the cooking school. It shows. With teaching 5 to 6 days a weeks, developing and managing new products like his Sizzle and Smooth spice blends, and juggling his numerous media and public speaking engagements, what’s next for Chef Eric? “I am working on cookbook based on my very popular couples cooking classes. It will have fantastic pictures and easy recipes for busy couples. It will imbue the feeling couples get when they take our classes. The cookbook will be out early next year or perhaps sooner, so stay tuned,” Chef Eric said. Chef Eric shares two recipes you can try at home. 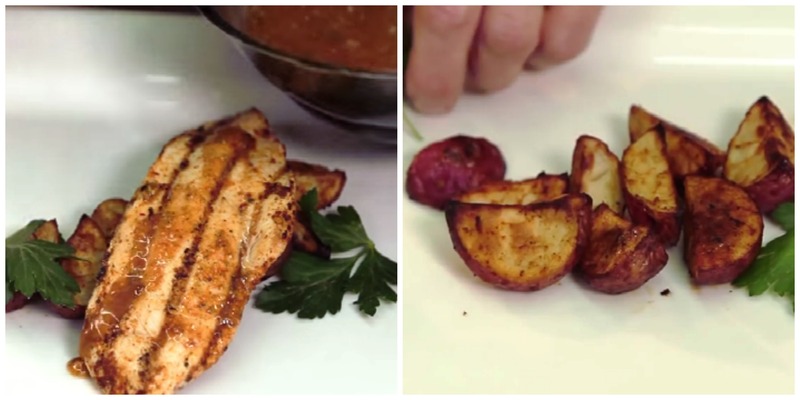 His Sizzling Grilled Chicken Breasts and Sizzling Oven-Roasted Potatoes. If the cooking bug in you yearns for more, see the list of cooking classes on his website at http://culinaryclassroom.com/. Now, get cooking! Cut the chicken breasts in half horizontally, making two thin cutlets. Put the finished chicken into a zip top bag or a pan and set aside. In a bowl, combine the orange juice, zest and Chef Eric’s Sizzle Spice Blend. Pour the orange juice mixture into the bag with the chicken and seal. Let the chicken marinate in the refrigerator for as long as possible. Overnight is fine. Preheat a grill pan over medium-high heat and spray the pan with vegetable oil spray. When ready to cook, remove the chicken from the marinade and grill for about three minutes per side, or until the chicken is cooked through. While the chicken is grilling, pour the leftover marinade into a small pan and bring to a boil. Remove from the heat and keep warm to use as a sauce. Serve on a warm plate and garnish with a spoonful of the sauce. Tip: Tofu steaks, turkey breasts, steak, fish and pork chops would be great with this marinade. In a large bowl, combine the olive oil, Chef Eric’s Sizzle Spice Blend and salt. Preheat an oven to 450 degrees. Wash and dry the potatoes. Cut the potatoes into halves and place them into the bowl. Toss the potatoes in the Sizzle mixture, making sure that they are coated in oil. Add more oil, if needed. Arrange the potatoes in a single layer on a baking sheet that has been lined with aluminum foil. Roast until the potatoes are tender, about 45 minutes to an hour. Serve with the Sizzling Chicken Breasts for a delicious meal.